Savoini is a Vicenza's legend and the club's record-man for appearances. His career started in 1949 at Alessandria playing as winger and joined Vicenza in 1953. His first seasons with Lanerossi were not easy but from 1957-58 he became a fan favourite and an irreplaceable player who captained the team for eight seasons from 1958 to 1966 and he still holds the record for most seasons played as captain. His primary position was left-back but he showed to be efficient even as a winger especially between the 1957-58 and the 1958-59 seasons: on February 9th 1958 he jokingly offers himself to substitute the unavailable Giancarlo Capucci, one of Vicenza's regular full-backs; however he becomes one of the best in that match, ended with a 4-2 win for Vicenza, thanks to his offensive raids down the side; because of this he was used as winger until the end of the season and the next one he alternated the full-back and winger positions also scoring 10 goals. 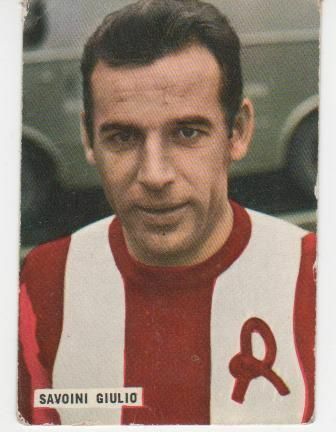 He retires due to injury in 1966 after 317 matches and 32 goals with Lanerossi. Savoini just wanted to play and it made no difference if he was used as full-back or winger because he worked with incredible efficiency in both positions thanks to a fervid intelligence and a good basic technique. His playstyle was solid in fact he never missed chances to be concrete, going straight to the point. He went down his side and back up again, running breathlessly but without losing lucidity. His moves were always characterized by the searching of the best result possible, not for him but for his team. Thanks to his incredible performances he was requested by clubs like Juventus and Roma but he decided to stay at Vicenza where all the fans loved him who was the team's soul.